There were a lot of exhibition opportunities for me this fall, and I am so pleased to have work on both coasts and in-between, currently on view. Friday night, my friend Pat DaRif and I set out for Chicago for the opening of the Quilt+Resist show at Woman Made Gallery in Chicago. I had not been to their new venue in the Pilsen neighborhood, up four flights to an exciting space in a converted factory. You can use the link above to see all the works in this interesting and diverse exhibit. My entry was Triangle Fire: Flightless Birds 2. Pat also has a piece in the exhibit, as well as internet friends, Amy Meissner and Paula Kovarik. I have two quilts in this exhibit, never shown before. The exhibit is open through January 3, at the Schweinfurth Art Center, Auburn, NY. Here is a photo of one of the quilts. These were constructed from a stash of found gloves and an abandoned blanket. 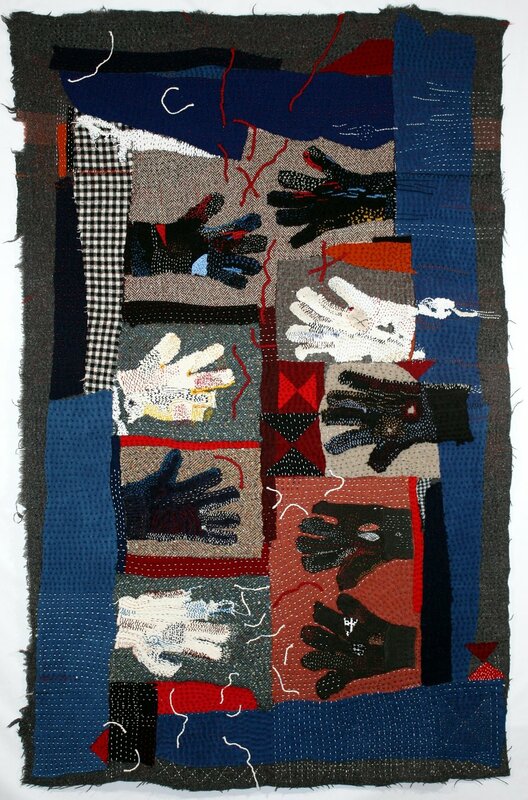 The quilt begins with a curious stash of gloves, all fibers and colors, worn and damaged. Stitched over many months, the work evolves into a familiar story of time and of loss. There is a special place in my heart for Visions Museum. This was the first big international juried exhibition I entered, back in 2014. Despite my amateurish photography, my work was selected. It was a small, quirky piece, The Lost Art of Mending: Constellation. Our youngest daughter was living for a year in the Monterey area, and Mike and I traveled to CA, (another first for me), for the opening in San Diego and a road trip along the coastal highway north. I think this early affirmation gave me the confidence I needed to continue in the art direction I was going, and to take some chances on other opportunities. 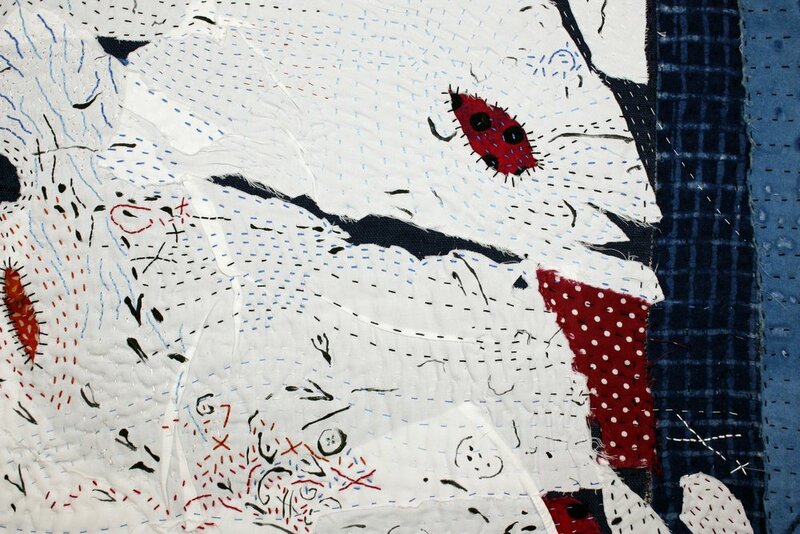 This year, I entered one of the laundry quilts, Sorted, and although I could not travel to the opening, the beautiful photography in the catalog took my breath away. I must have misunderstood the directions, so my pithy, to-the-point artist statement was not published, rather, they used my “general artist statement” which was okay too (though the words in bold were omitted, and I don’t want to seem presumptuous that my work is always “insightful”) Here are the both of them. I found a dozen white cotton shirts, wadded in the corner of a forgotten box. Wrinkled thieves of time, happily abandoned for permanent press. The lives of women, and how we are connected to textiles, is what interests me as an artist. I collect worn clothing, domestic linens and sewing scraps, and then I construct meaning from these pieces of cloth. I enjoy the process of working with materials that have passed through other hands, and I look for a story, maybe a snapshot of a moment, to open a visual narrative. The idea of women’s work is a recurring theme in my art, so I use hand stitching and embroidery to hold the pieces together, to bind the layers and gather the textile detritus of the everyday into a new whole. The work I do, and the way of working that I value, is slow and mindful. In the end, I want to create an insightful visual image, one that invites viewers to look closely and make connections to their own stories. Where the Crawdads Sing, by Delia Owens; Transcription, by Kate Atkinson; A Tale for the Time Being, by Ruth Ozeki, and The Golden State, by Lydia Kiesling. Story Cloth is about searching for meaning in pieces of cloth, making connections between women, work and textiles.